First I’ll start with how I got to meet with the FAA. 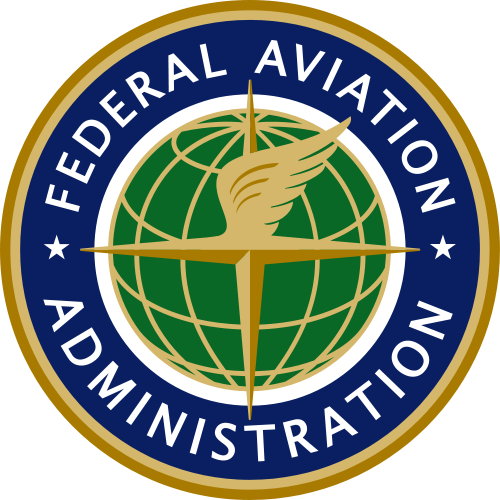 If you don’t know this already…meeting with the Federal Aviation Administration is NOT on the top of any pilot’s wish list. Usually that means you’ve done something bad. It’s like the law enforcement of the skies. Worse than being pulled over on the road by a state trooper. 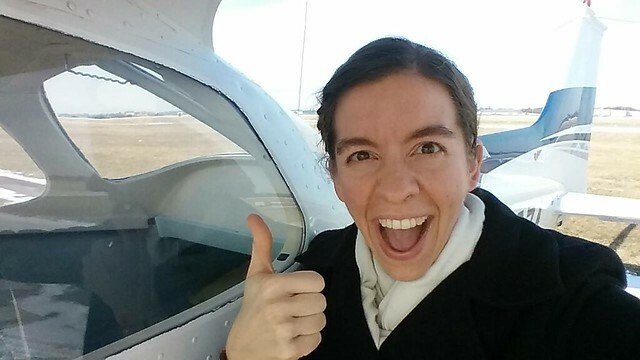 However, my instructor handled everything and prepared me so well for each part of it, that I never felt scared or really all that nervous with meeting with the FAA investigators, or our club’s board members later on. So anyway, after I finished all of that, I started thinking about going flying…because isn’t that what you should do on a pretty sunny day?! The flight was great. 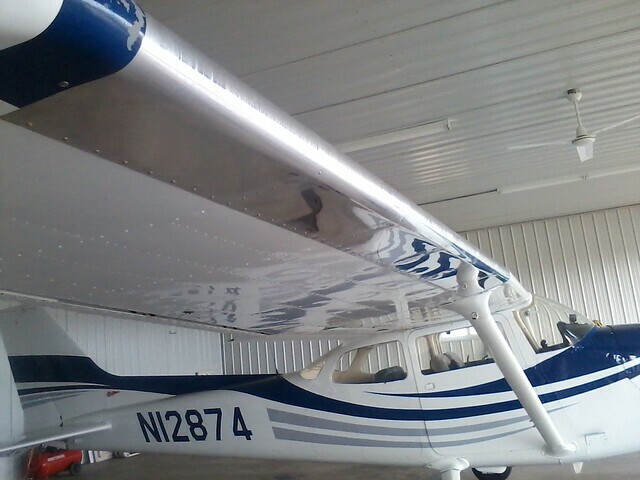 I took up my favorite airplane, 12874, and I practiced S turns and some other ground reference maneuvers, and even did some crosswind landings. 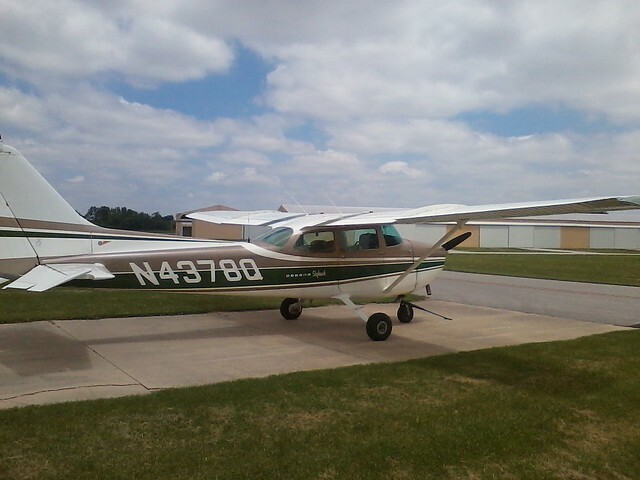 Jim was right after me with the plane, so he was there at the hangar when I came back. I was taxiing towards the hangar, when another larger airplane was coming off of the grass ‘taxiway’ that they use to go to and from a restaurant, onto the taxiway I was using…toward me! 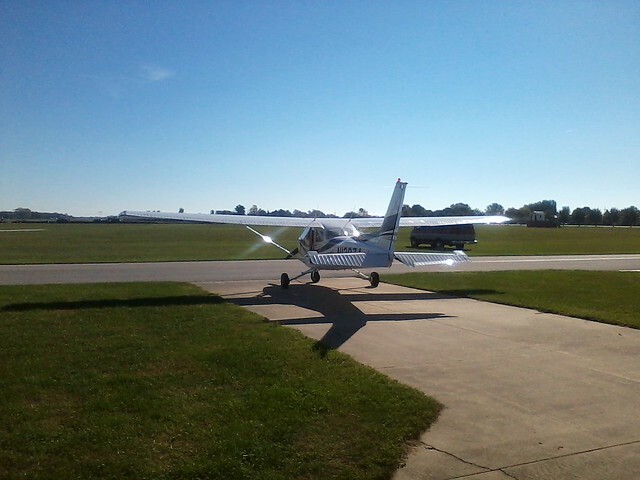 I got a little nervous, and was thinking, “I need to get off of the taxiway” and “I hope they see me!”. Thankfully, they did see me, and they stopped so I had plenty of room. But I was so fixated on them that I didn’t watch my right wing as I swung around in front of our hangar like we usually do to park it. At first it didn’t register what had happened. It didn’t really jolt me, and I just thought I was stuck in the grass (ha! )…then I saw Jim signalling to me to shut off the engine, and I looked over and realized that I had hit the hangar with my right wing. “No!” I thought, “Nononononono!! !” Things like this happen to other people. Not me. I’ve never even dented a car. How could I have dented an airplane wing? OH BROTHER! Now what?! The dented wing. It might seem like a lot of bother for such a little dent, but they had to check out the whole wing to make sure other parts of the wing weren’t damaged. 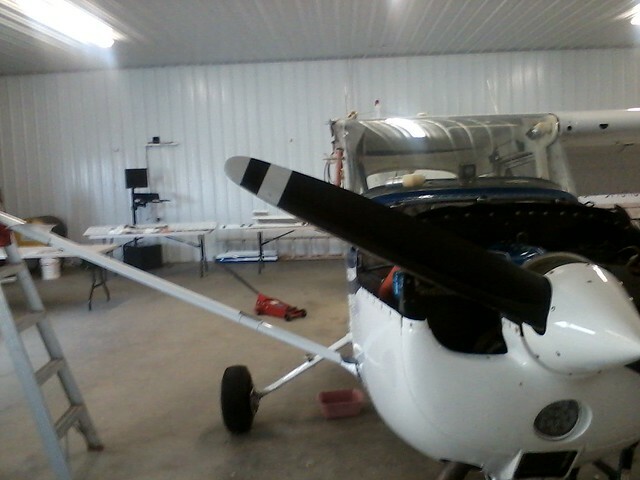 Jim was very, very kind and assured me that “things happen”, and he helped me pull it out of the grass and put it into the hangar and put it out of service on the scheduler. I tried calling Ted to tell him what had happened, but he was flying, so I texted him so he would know when he landed. 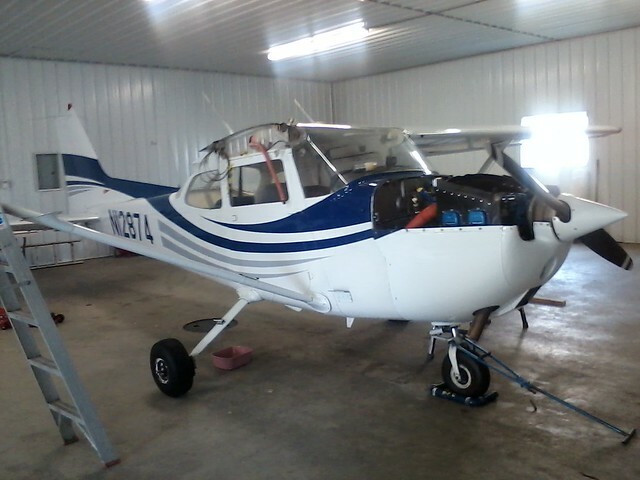 Thankfully, we have two Cessnas, so Jim got the other one ready for the ride he was supposed to be giving. I knew that “things happen”, but I still felt really bad that I had done that to the airplane. I’ll come back to the dual cross country trip later (it was aMAZEing!). They took off the wing completely and sent if off to get repaired. Like I said before, Ted did a great job of preparing me and keeping me updated on what was happening with the plane, and what to expect when we met with the FAA inspectors. I am immensely grateful (and terribly sorry), for all of the work that the board members did because of my wing incident. They had insurance to deal with, the FAA to deal with, and a lot of paperwork and decisions I know nothing about, I’m sure! And all of them were very kind through the whole thing, encouraging me to keep flying, and telling me not to worry about it. When Ted and I were planning my dual cross country, he had a phone call from one of the members, and apparently they asked if I was okay, and if I was still flying. He told them, “Well, we’re planning a cross country right now, so it must not have deterred her too much!”, then when he got off of the phone he teased me, “Everybody is asking, ‘Is Jessica okay? How is she feeling? Is she still flying?! '” It’s like having a bunch of extra uncles and grandpas looking out for you! Lol! On August 19th, Ted and I met with two inspectors who drove up from Indy to the Rochester airport. I was glad that my first meeting with the FAA was with Ted. Although they were both very kind as well and also assured me that “things happen”, it was still nice to have someone there that I knew! I had to describe what happened, draw a diagram of what happened, then sign and date the diagram. The ‘diagram’ was not the best artwork ever (you know ‘stick people’? I drew ‘stick airplanes’! ), but I guess it gave them an idea of the incident…and so somewhere in their files they have my original copy of stick-airplane artwork, lol! Then he asked me what I would have done differently, and went over my logbook and some other things, then we walked out to the hangar so that they could see where it happened, and I could explain the incident again. With the FAA there are accidents and incidents. Incidents are the lesser of the two…so I was grateful that my wing dent was in that category. Some of the things we’re required to do in aviation would be rather helpful in driving. Like if you were tested in your ability to use a map…you know, the paper kind?! 😀 I’m a lot more comfortable using a sectional (aviation map) than I am a road atlas. I guess they figure if you get lost on the ground and your GPS quits working, you can get out and ask someone for directions. If you get lost in the air, it’s not quite that easy! After meeting with the FAA, I helped Ted change the oil in 78Quebec, then we practiced some crosswind landings in some strong gusting winds. Part of our club’s rules is that we have to meet with the board if we have an incident or accident like this. Once again, they were all very kind…even though I did put one of our airplanes out of commission for more than a month during our busiest flying season, and caused a bunch of paperwork and trouble. 🙂 I so love my flying club…they’re the best! 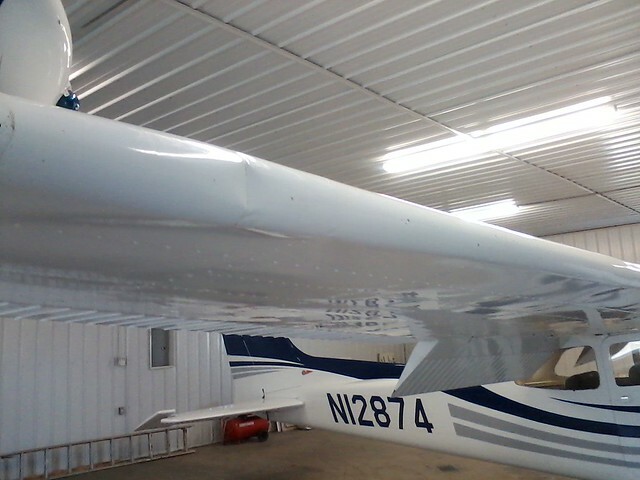 Tom, our club’s president, said that he rather liked the shiny aluminum look…couldn’t we just strip the paint off of the rest of the airplane? Lol! Next time, I’ll tell you about my first cross country…it was so. much. fun! My Flying Story Part 9: Dual Cross Country!